Both games removed from the nominee list are based on Nintendo properties. One of the catagories in the upcoming Game Awards is "best fan creation," - which honors the coolest fan-made mods, add-ons or completely new games of the year. 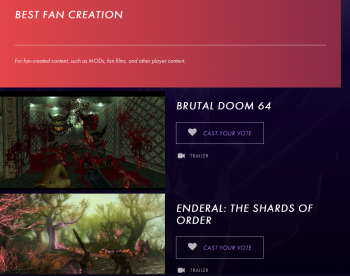 This year, the list of nominees is strangely small, with only Brutal Doom 64 and Enderal: The Shards of Order listed. That's because two fan creations were myseteriously dropped from the nominee list over the weekend: Pokemon Uranium and AM2R. For the uninitiated, Pokemon Uranium is a PC Pokemon fan game, while Project AM2R is a fan remake of Metroid 2. Both games are based on Nintendo properties and the leading rumor at this point is that Nintendo, who have supported The Game Awards in the past, has asked the awards show to remove the nominees. We've reached out to some of the relative parties: Nintendo, and the developers of the two fan games, to try and clear things up.